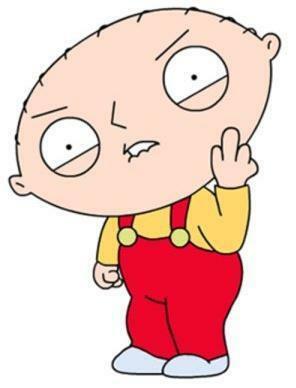 Stewie giving the middle finger. Stewie giving a little present for all of us.. Wallpaper and background images in the Family Guy club tagged: family guy stewie middle finger hilarious awesome funny. Stewie giving a little present for all of us. This Family Guy photo might contain anime, truyện tranh, phim hoạt hình, and manga.